Not so much in the way we win but the way we play to win. In the past Jose would have said we nicked the victory, it was a lucky shot, watever…. but yest I do not think he can make mucho excuse. Sissoko was awesome last nite (even when Gerrard was not playing – SG was only played in the 2nd half). Gonzalez impressed… even Aurelio looked very steady. And Bellamy is certainly a very good buy. Everytime he has the ball, you can sense panic in the Chelsea defence. Jose boasted about his 50%-ready team taking on Liverpool. Rafa responded by leaving out our Gerrard, Alonso, Hyppia and Bellamy from the starting lineup… We started with just Momo (relatively unproven) against their top midfielders of Lampard, Ballack and Essien!! And we drew 1st blood first. Go figure, Jose. 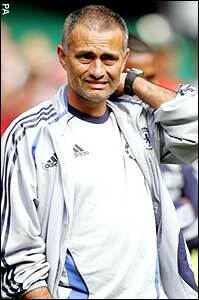 Mourinho’s face when they were presenting the medals to the winner and runner-up were priceless!! Oh I also noticed Jose and Rafa didn’t shake hands after the match. btw we followed this game at Finnegan’s Pub along Jln Sultan Ismail. Didn’t order any of their meals as we’d just had our dinner but the waiter was very friendly and the environment not bad. Yan ordered mushroom soup and it was served with three slices of garlic bread. Good value. Looks like we’re having dinner there again next Sat as Liverpool is playing away to Sheffield Utd at 8pm local time. Is this how it’ll be?